MyHome, one of NYC’s leading renovation companies, recently completed a total apartment renovation at 400 East 56th Street in Manhattan. Remodeling Consultant Lior Noy and his team were tasked with completely transforming a dated apartment with very old appliances and fixtures, and poor lighting. The remodeling goals for this project were set to achieve a high-end look with the best quality materials. 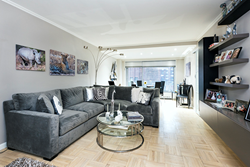 MyHome, the Manhattan-based renovation company, recently completed a total apartment renovation at 400 East 56th Street in Manhattan. The project was designed and managed by MyHome Remodeling Consultant, Lior Noy. Noy and his team were tasked with completely transforming a dated apartment with very old appliances and fixtures, and poor lighting. The challenge? Due to building regulations, the renovation had to stick with the existing footprint of the apartment and the electrical box in the kitchen couldn’t be upgraded. The transformation of this 1.5 bedroom, 1.5 bathroom apartment included a full kitchen remodel, bathroom renovations, floor refinishing, soffits and lighting work, paint and a new closet. The remodeling goals for this project were set to achieve a comfortable second resident layout space that integrated a high-end look with the best quality materials. In the kitchen, custom made cabinets were set using a European high-gloss lacquered melamine door finish. This same material was also used to enclose a kitchen A/C unit. The countertops featured Caesarstone quartz materials. Caesarstone is the leader in the engineered stone marketplace offering a revolutionary use of 93% quartz particles in their counters. Accenting the high-gloss cabinets, the wood floors were restored using bleach and white wash stain. To finish the high-end look in the kitchen, the homeowner chose a Hansgrohe faucet. Despite the stunning final look, the kitchen posed a unique challenge. Part-way through the renovation, building structure complications restricted upgrading the electrical box. This meant the electric oven that was part of the original design couldn’t be used. To amplify the challenge, the cabinets had already been designed and ordered based on this specifics of the new oven. Luckily, Noy is an experienced remodeling consultant and project manager. He was familiar with a quality American Range gas built-in oven that used the same dimensions as the electric oven in the original design. So, the team was able to move forward with a slight adjustment to design and the plumber extending a gas valve to feed the oven. The tile work in the bathroom featured Porcelanosa tiles for the floor and wall. A state-of-the-art Hansgrohe shower system and faucets were installed. The final pieces in the bathroom renovation were a Toto toilet and Caesarstone slabs to complete waterproofing and edge details. A center-piece of remodeling project was the dining room. This area was bordered and defined with a beautiful drop ceiling detail and recessed lights set to fit the new dining table. MyHome was founded in 2001 by managing partner Yoel Piotraut. The company, which is based in New York City, has a team of consultants, designers and managers. MyHome’s New York City kitchen and bath showroom is located at 353 West 48th Street in Manhattan. Lior Noy has been working with MyHome since 2003. A background in landscaping grants Lior the ability to exercise his knowledge regarding creative placement of objects, development of functional designs and seamless integration of room components.